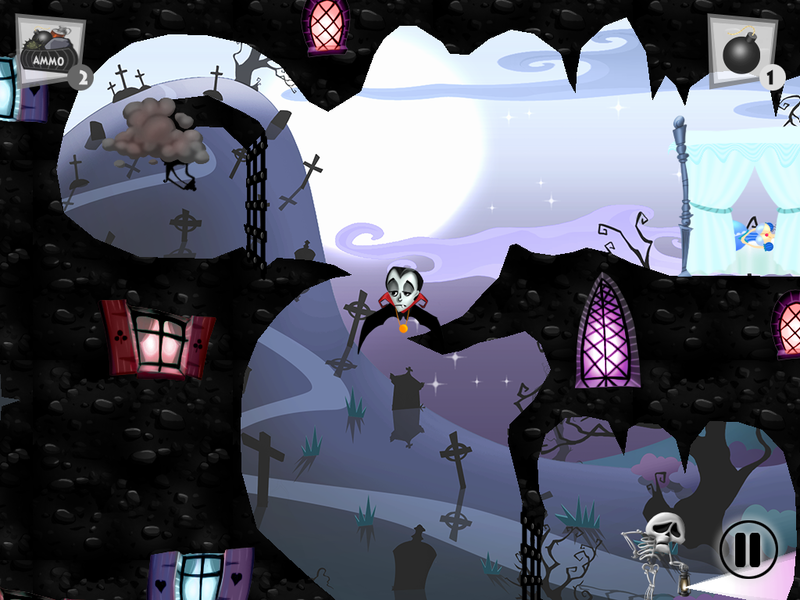 √ More than 35 mind-blowing levels with frightening realistic physics! √ Wide ammo range: from plain rocks to magnets, blowing bags, smoke and water! 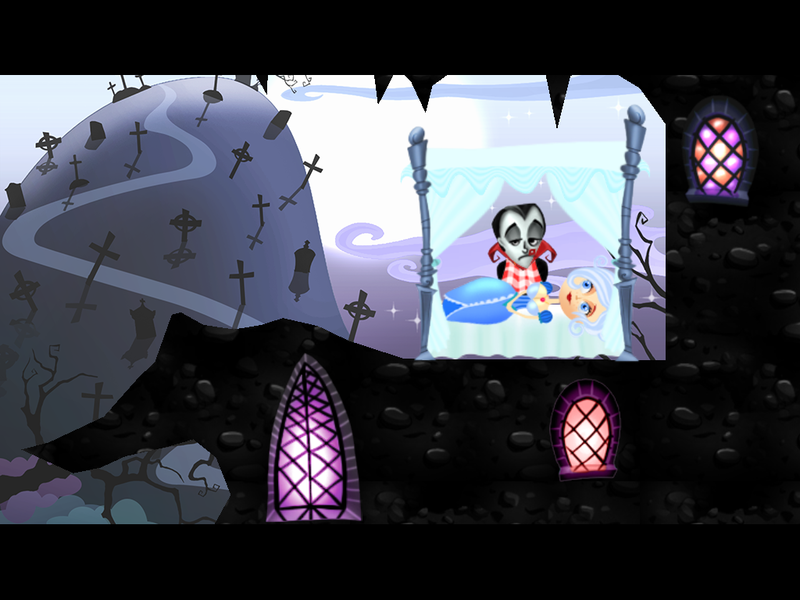 √ 4 amazing worlds to discover: The Catacombs, The Spooky Castle, The Enchanted Forest, The Hell Caves! 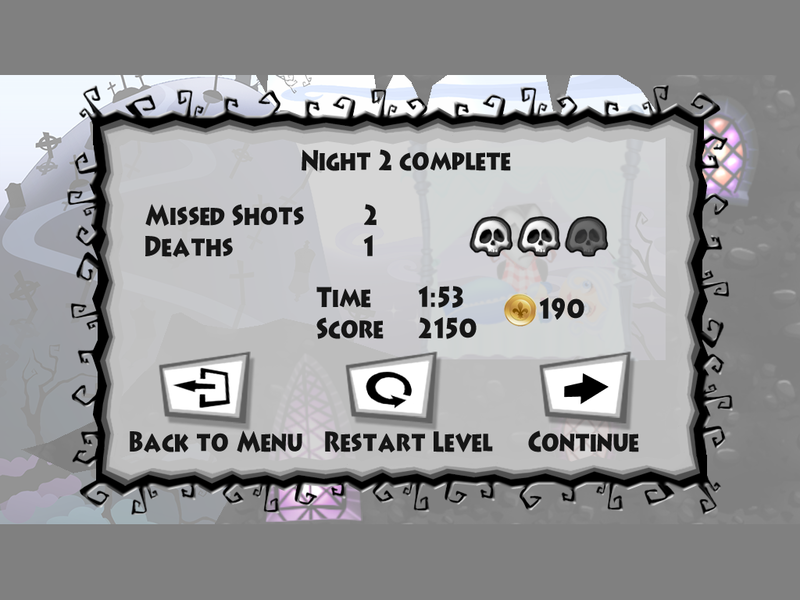 √ Purchase extra ammo with in-app purchases for unlimited shooting fun! 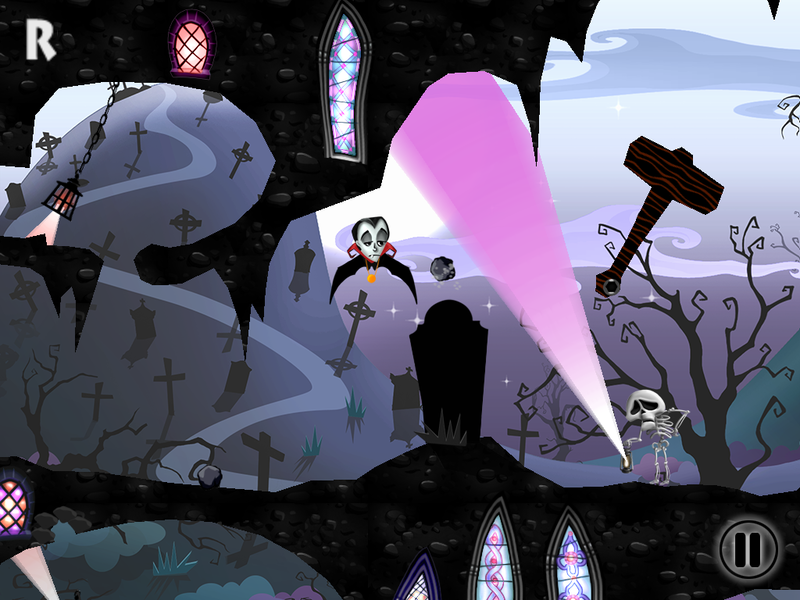 √ Excel your playing skills and earn up to 3 skulls in each level! 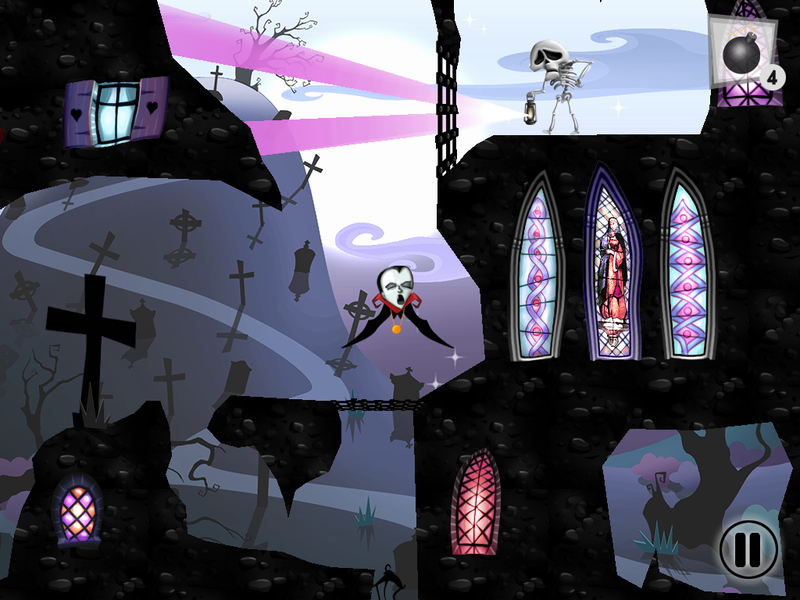 √ Use in-game solutions per level should the puzzles get too difficult! 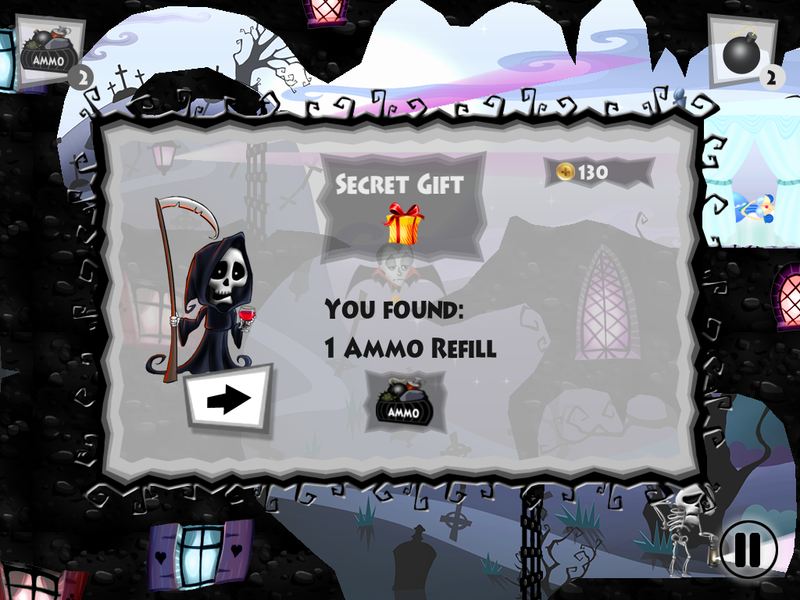 √ Unlock mysterious bonus levels and find secret gifts! √ Scary dark humor and other surprises guaranteed! A: Turn Off the Lights was more of a lucky encounter for us. At the beginning of 2012 we visited some friends from the games industry in Romania and got in touch with a new small funky team which had a prototype of the Vampire. We liked what we saw, we were already building our Publisher path, and we knew this would be a great match. It took up to spring to have things in place, and we started to work along with the developers on polishing and publishing the game. A: The game was released on October 29th, not sure why but on the App Store it’s stated the 2nd of November J Close enough anyway. A: Well it’s hard to pick. We really love our game fully. But if we really had to pick something… we’d say: smart puzzles that can keep a whole family busy, humor (we could also add “dark” or “Transylvanian” humor), it puts back the “scary” in the Vampire (no more sparkles) and we really like the artwork! It’s not something everyone will fall for, but it is something different, it sets a mood that we hope lots of players will feel. 5. What skills were you hoping to help the end user to develop? A: We hope to set new standards through the challenging physics puzzle, players can improve their analytics and motor skills. But as we mentioned, we feel the artwork is different and can raise the bar for “original content” whenever they search new games on the App Store. A: We marked the game as 9+ as we do suggest a “biting” moment and some people might not like it. But the fact is that most of our friends/colleagues kids (aged 4-9) have played this game through various stages of development and really had fun with it. A: First update is already submitted. Should reach our players as early as next week. We fixed some bugs and updated some text content. The second update is planned for December and includes localized texts (in French, Italian, Portuguese, Spanish, German and Russian), achievements (yeeey!) and Game Center support. We have other updates planned, hoping that at the beginning of the next year we will be able to support 3-4 more Asian languages. We’re planning to stick around for a while! The kids thought this reminded them of a mixture of Hotel Transylvania and Angry Birds. 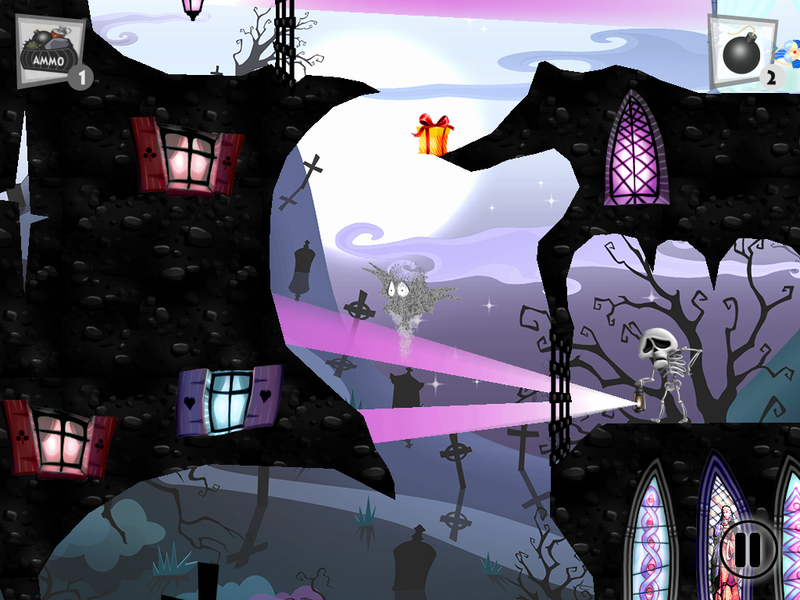 The premise is to get the bat to break lanterns along each path and reach the “maiden” at the end. When you press the “Play” tab, an introductory animated scene plays-there are Halloween themed characters (a devil, witch, vampire, frankenstein and the grim reaper) gathered around a dining table, consuming (perhaps?) blood and a cake adorned with “666”. 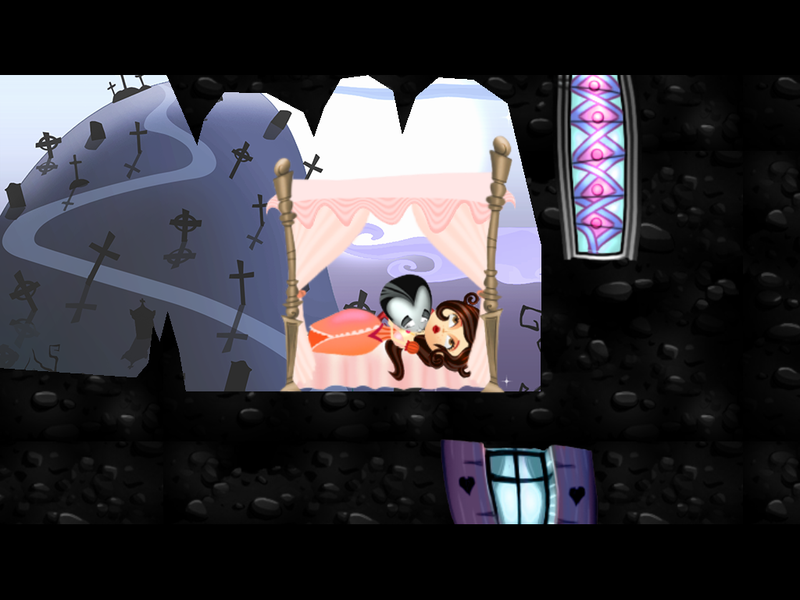 In the animated scene, the vampire is given a present of a key- the key leads to a room holding a buxom princess, and the look on the vampire’s face when he realizes his “present” is a bit much, in my opinion. My two boys haven’t even seemed to notice or care, but I wanted to give a heads up for those who are more squeamish about such things. 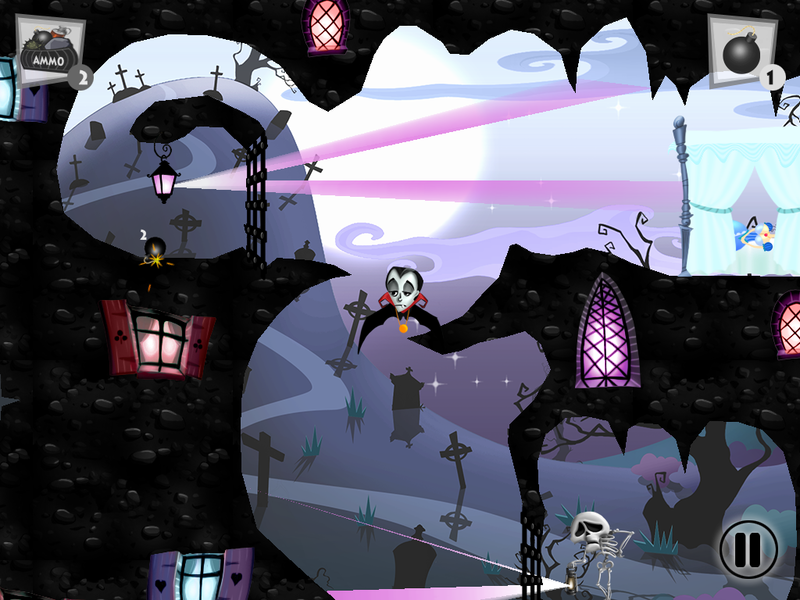 The cartoon-style animation and cheery music keeps the tone of the app less scary and more fun. The background music is spooky but lighthearted, and could also be turned off under the “More” tab, which is cleverly designed to look like a tombstone. Under this same tab are controls to turn the sound effects on or off, to view the developers’ credits, or to purchase additional coins for play. There is also a link to Facebook in the upper left hand corner. We generally stay away from apps with unlimited in-app purchases, as they can add up pretty fast if you have forgotten to adjust your settings after making a purchase, so I definitely wouldn’t mind seeing a double press or other family-friendly feature added to make it a tiny bit harder to enter this area- although it didn’t bother me as much as I thought it would.